Is this the reason why the aircraft carrying Sushma Swaraj went incommunicado for 14 minutes? The pilots flying the Embraer 135 Legacy carrying external affairs minister Sushma Swaraj "could not contact" officials of the Mauritian air traffic control, when it crossed over and entered Mauritius' airspace. 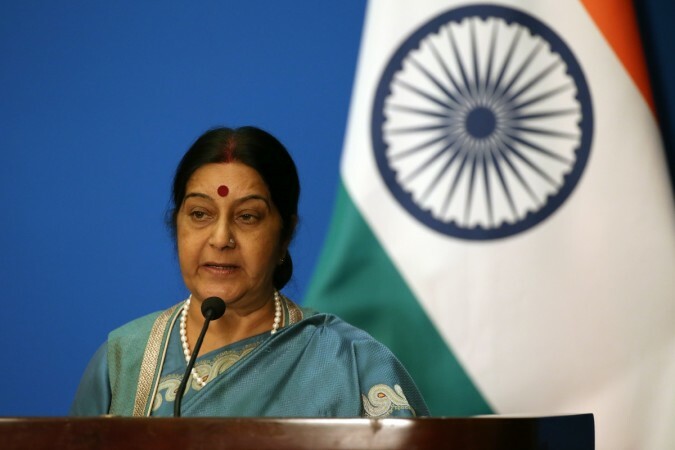 An Indian Air Force aircraft carrying external affairs minister Sushma Swaraj to Mauritius went incommunicado for around 14 minutes on Saturday (June 3), and triggered a minor scare. The flight had taken off from Trivandrum in Kerala after 2 pm, where it had stopped for refuelling. It had established contact with Male Air Traffic Control, but then the pilots flying the Embraer 135 Legacy carrying Sushma Swaraj "could not contact" officials of the Mauritian air traffic control, when it crossed over and entered Mauritius' airspace. The Mauritius Air Traffic Control officials then pressed the panic button and sounded the "INCERFA" alarm. According to international aviation rules, INCERFA is the first of the three emergency phases, which is declared when the authorities are uncertain about the safety of an aircraft or its occupants. "Aircraft changed over from Indian airspace to Male ATC which then established contact with the aircraft at 4:44 pm IST. However, IFC 31 could not contact Mauritius ATC after entering Mauritius airspace. Mauritius ATC then activated INCERFA (the uncertainty phase). Later at 4.58pm IST, IFC 31 came in contact with Mauritius ATC and landed. Mauritius ATC activated INCERFA (uncertainty phase) without allowing the stipulated time period of 30 minutes to lapse from the time when aircraft last contacted ATC. This was perhaps done because the flight was carrying a VIP," the Airport Authority of India (AAI) said in its statement. "Over oceanic airspace, air traffic control (ATC) globally waits for 30 minutes to sound INCERFA for a plane if it does not contact it on entering its airspace of flight information region. In this case, the Mauritius authorities pressed the alarm button 14 minutes after the flight IFC-31 entered its airspace and contact could not be established with the plane," a senior official AAI explained. According to a senior official from the Air Traffic Control the aircraft may have gone off the radar as communication over oceanic area is often problematic due to erratic Very high frequency (VHF) communication, reported The Times of India. "Sometimes pilots are unable or forget to contact the Mauritius area. That oceanic area has no radar coverage and everything depends on VHF/HF communication. Such places where VHF coverage is not good are known as dark zones," said the official. The flight landed safely in Mauritius and Swaraj met the island nation's Prime Minister Pravin Jugnauth during the brief stopover. Later she flew to South Africa to attend the foreign ministers meeting of BRICS (Brazil, Russia, India, China and South Africa).